With Warren Force poised to attack Giropa Point, and Urbana Force moving to envelop Buna Mission along the newly established corridor from Entrance Creek to the coast, the reduction of the enemy positions on the Buna side of the Girua River was finally at hand. This was to be no easy task. The enemy at Buna was heavily outnumbered and almost completely surrounded, but he was fighting with the utmost ferocity and was to be cleared out of his remaining positions at Buna only after some of the bitterest fighting of the campaign. Colonel Dobbs fixed zero hour at 1600. The tanks were delayed, and the attack did not get under way until 1715, following an artillery preparation with smoke. In an effort apparently to make up for lost time, the tanks moved at high speed and came in obliquely across the line of departure. Without waiting for the slower-moving infantry to close in behind them, they moved north without moderating their speed. The infantry as a result had to attack independently of the tanks, and the tanks, far in front of the infantry, had to move on the enemy bunkers without infantry support. The fresh 2/12 Battalion reached the front that night, 29 December. Early the following morning Brigadier Wootten ordered it to take over on the left in place of the 2/10 Battalion, which had seen a great deal of action and needed rest. The day was devoted to regrouping and reorganization. Colonel Arnold went forward to reconnoiter the front his battalion was to take over. Major Beaver's 126th Infantry troops, who were also in need of rest, exchanged places with Colonel MacNab's battalion, the 3d Battalion, 128th Infantry, which after a week of rest in the Cape Endaiadere area was again ready to attack. At 1535 Brigadier Wootten issued a carefully drawn plan for the reduction the next day of Giropa Point and the area between it and the Old Strip. The attack would be supported by the mortars of the 2/10 Battalion, the 25-pounders of the Manning and Hall Troops, and the 4.5-inch howitzers of the Stokes Troop. Of the eleven tanks of X Squadron, 2/6 Armored Regiment, nine would be committed to the attack: six immediately, and the remaining three as they were needed. Australian freighter Comara came into Oro Bay with 350 and 500 tons of cargo, respectively, unloaded, and departed before daybreak. The arrival of the Bath and the Comara marked a logistical milestone in the campaign. Since the night of 11-12 December, when the Karsik made the first pioneering trip to Oro Bay, six freighters making nine individual trips had brought in roughly 4,000 tons of cargo. This was more than three times the 1,252 tons that the Air Force had flown in to the 32d Division during the same period, and 1,550 more than the 2,450 tons that it was to fly in for the 32d Division's use during the entire period that the division was in combat. Between the freighters and the luggers, an average of 200 tons of cargo was now coming into Oro Bay daily and had been since 20 December.7 Supply at Buna, in short, had ceased to be a problem just as the fight for the place was coming to an end. After a heavy artillery and mortar preparation, the troops on the right and left moved out for the attack at 0800, New Year's Day. On the left, Companies A and D, 2/12 Battalion, and the six tanks cut northeast through the plantation toward the coast. The 1st Battalion, 128th Infantry, followed them. Facing north, Companies I, K, and L, 128th Infantry, moved on the dispersal bays off the northwest end from below (south), and the 2/10 Battalion, facing west, remained in position on the Old Strip. Without tanks to support it, the attack by the 3d Battalion, 128th Infantry, went slowly. The Japanese in the dispersal bays were well entrenched and fighting hard. On the left, the attack made excellent progress from the start. Closely followed by the infantry, the tanks made short work of the enemy defenses in the Giropa Plantation. The leading tank reached the coastal track below Giropa Point at 0830. A half-hour later all the tanks and most of the infantry had reached the coast. The 1st Battalion, 128th Infantry, moved forward, mopping up pockets of enemy resistance that the Australians had overlooked or bypassed. Company A, 2/12 Battalion, with Company D immediately behind it, anchored its left flank on Giropa Creek, just west of Giropa Point, and began to consolidate on a 400-yard front along the shore. Companies B and C, 2/12 Battalion, which had been operating to the rear of Companies A and D, began moving eastward and southeastward with the tanks to complete the second phase of the attack. FIRING A 60-MM. MORTAR into the enemy lines at Buna Mission. At 1330, 28 December, while Urbana Force was tidying up its corridor from Entrance Creek to the coast and preparing to move forward to the sea, General Eichelberger, accompanied by General Sutherland, Colonel Bowen, Colonel Rogers, and Colonel Harding, arrived at Colonel Grose's CP from Buna Force headquarters. Asked for a report on the situation, Grose gave Eichelberger a resume of how things stood. Among other things, Grose told Eichelberger that he had just taken the 3d Battalion out of the line for a much-needed rest. At 1428, without discussing the matter further with Grose, Eichelberger ordered that the 3d Battalion, split into two elements, launch an immediate attack on Buna Mission. One element was to advance on the mission from the island by way of the north bridge; the other element, starting from the southern side of the island, was to move upon it in five Australian assault boats which had reached the front the day before. The preliminary tasks were completed in short order. Captain Hewitt, who had gone out in one of the assault boats, returned with the results of his reconnaissance. Six enlisted men volunteered to lay in place the three heavy timbers that would span the gap at the northern end of the bridge. 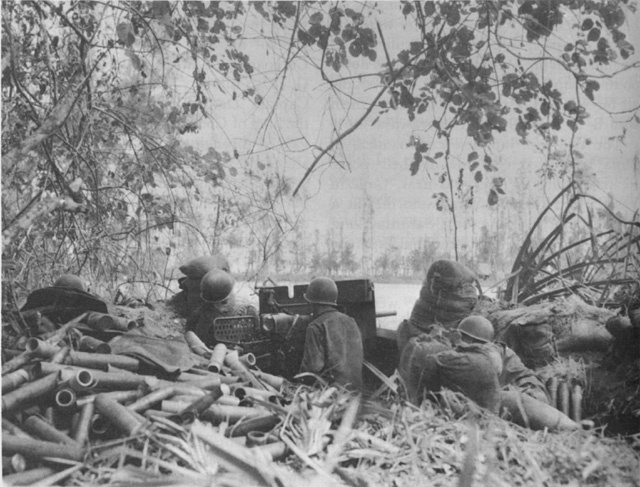 Commanding the assault boats, 1st Lt. Clarence Riggs of the 3d Battalion's Ammunition and Pioneer Platoon quickly moved them into position in some heavy foliage off the southern side of the island. The rest of the 3d Battalion, guided by Colonel Rogers, began moving forward to the bridge area from the center of the island. Having been told only a little while before that they were to be given a rest, the troops of the battalion were slow in moving forward, and Colonel Rogers was unable to get them into position south of the bridge until the first salvo of the artillery preparation hit the mission. Major Schroeder's line now extended from Entrance Creek to the sea, but the troops on the island were still held up by fire from the northern end of the bridge. An apparent solution to the problem was found that night. Just before midnight a patrol of Company H, 127th Infantry, under 1st Lt. Allan W. Simms, waded across from the village sandspit to the spit projecting from the mission. The patrol remained on the mission side of the creek for half an hour, without receiving any fire or finding any Japanese in the area. On the basis of this evidence of enemy weakness, a new plan to envelop the mission was drawn on 30 December. the line was held by Companies F, A, K, and L. Elements of Company M and Company B in platoon strength were in place in the gardens on both sides of the corridor; Companies C and I were in the center of the corridor; Company D was to the east of it facing Giropa Point.23 It was clear that the enemy for all his tenacity would not be able to hold on the coast when the attacks from the village and the island got under way. Colonel Grose waited on the village spit to hear news of the attack. He had a man with sound-powered telephone and a roll of wire following the action and reporting on its progress. The first information Grose heard on the phone was that the lieutenant who had taken command when Bragg fell was "running to the rear," and that there were others with him. The steadiness under fire of Captain Cronk's company had saved the day. General Eichelberger finally had his long-sought toe hold on the mission, and Captain Yasuda's troops, under attack for the first time from two directions, faced annihilation. On the right, the Australians with their tanks have moved up to the mouth of Simemi Creek, [and] the entire area of the two strips is in our hands. Martin's men have extended to the left from the Old Strip for several hundred yards so that the forces of the Urbana and Warren fronts are now only about 600 yards apart. On the left, we have established a corridor between Giropa Point and Buna Mission, and have moved enough men in there to make it hold. The famous "Triangle" which held us up so long, was finally taken, and our men also occupy the island south of Buna Village. Today, we are moving on Buna Mission from both directions, and I sincerely hope we will be able to knock it off. It was a desperate plan, but not necessarily an impracticable one. The Japanese must have known from clashing with Lieutenant Chagnon's fifty-two men near Tarakena that the American flank covering Buna was virtually undefended. They may have thought, therefore, that Colonel Yazawa's raiding party might still save the defenders of Buna Mission--only about two miles from Tarakena by beach--by launching a sudden surprise attack, advancing swiftly, and making a quick withdrawal. General Yamagata lost no time in complying with General Adachi's orders. On 27 December he ordered 430 men from Danawatu to Giruwa, with orders to report to Colonel Yazawa. Yazawa, who had led his regiment across the Owen Stanleys and back, was perhaps the most experienced and resourceful commander the Japanese had at Giruwa. The fact that he was detailed to the task of rescuing the Buna garrison was an indication of the importance Rabaul attached to his mission. Yazawa began assembling troops for the thrust eastward, the fall of Buna Mission was imminent, and most of its defenders had only a few hours to live. On New Year's day, while Warren Force and its tanks were reducing Giropa Point, Urbana Force launched what it hoped would be the final assault on Buna Mission. Early in the morning, while Company B attacked eastward toward Giropa Point, the artillery and mortars laid down a heavy barrage on the mission and the rest of Urbana Force struck at the Japanese line around the mission. Captain Cronk attacked from the mission spit, and Major Schroeder's troops, pivoting on Entrance Creek, moved on the mission from the southeast. Some Company B men could already see the tanks on Giropa Point, but the unit was still held up by very strong enemy resistance. Company F, 128th Infantry, left alone on the spit when Colonel Grose withdrew Company E, 127th Infantry for reorganization, also found itself unable to move forward. In the swamp Company C, supported on the right by Company M, moved forward 150 yards, and the remaining companies to the right of M--F, A, and L, with I and D immediately to the rear--made some progress. A heavy artillery barrage and white phosphorous smoke shells hit the enemy before the troops finally jumped off at 1015. Captain Cronk's company on the spit attacked southeast. Company C in the swamp, with Company M still on its right, attacked toward the north bridge between the island and the mission. The two G Companies--Company G, 128th Infantry, and Company G, 127th Infantry, with the latter unit under Captain Dames leading--passed through the lines of Companies I, L, and M and advanced through the Coconut Plantation to attack the mission from the southeast. The attack went smoothly from the first. The phosphorous shells set fire to the grass and trees at several points in the mission area and, in one instance, exposed a whole line of enemy bunkers to Allied fire. Attempts by the Japanese to flee these exposed positions were met by machine gun fire from the troops on the island and on the mission spit. As the phosphorous shells exploded in trees, they also set afire several of the huts in the mission. When enemy troops in dugouts beneath the burning huts tried to escape, they ran into bursts of Allied fire which killed most of them. 37-MM. 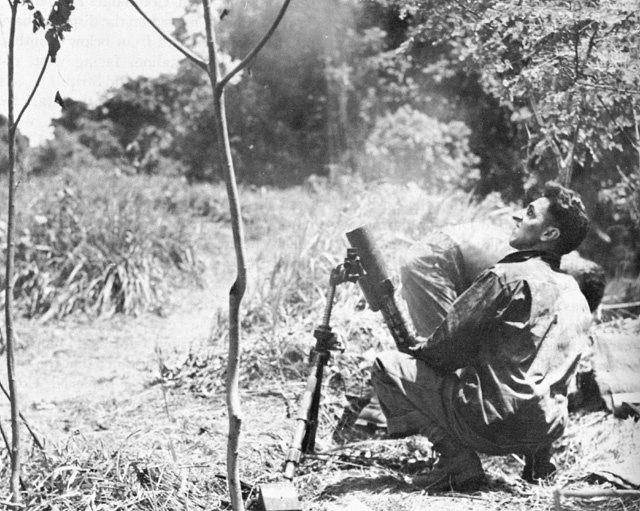 ANTITANK GUN in position to fire at the enemy in Buna Mission. At 1400 Company C was in sight of the bunkers covering the north bridge. An hour and a half later Company G, 127th Infantry, reached the point of the mission with Company G, 128th Infantry, hard on its heels. Only scattered rifle fire met the troops, and they quickly took their first prisoners--a dozen Chinese laborers, naked except for breechcloths. Ten minutes later Company C came up, followed by Company M, and in a few more minutes Companies I, L, and A reached the scene. The engineers had meanwhile been repairing the north bridge. By 1620 Company H was across it, thus finally completing the envelopment. The mission was overrun by 1632. The remaining enemy troops in the area were either flushed out of their hiding places and killed, or entombed in them. By 1700 the fighting was over except in a few pockets of resistance near the beach. There a handful of Japanese held out stubbornly and were left to be dealt with the next day. In its attack toward Giropa Point, Company B had been held up by a line of enemy bunkers in the road junction near the coast, which had been bypassed in the coastal advance. As soon as he could, General Eichelberger pulled Company C out of the mission area and sent it to the assistance of Company B. The two companies launched a concerted attack late that afternoon, cleared out the bunkers, and by 1930 had made contact with the 2/12 Battalion. With the 2/10 Battalion and the 1st and 3d Battalions, 128th Infantry, the 2/12th had finished clearing out the area between Giropa Point and the west bank of Simemi Creek earlier in the day.43 After more than six weeks of fighting, the Buna area in its entirety was finally in Allied hands. [By] Sunday, the . . . front from the shattered palms of Buna Village to Cape Endaiadere was almost peaceful. It was possible to walk its entire length and hear only a few scattered shots and occasional bursts of mortar fire. In the . . . swamp . . . a few Japanese snipers still held out, in a patch of jungle . . . a bunker or two still resisted, but great stretches of the front were scenes of quiet desolation. . . . The only considerable fighting during the day occurred in the jungle area southwest of Giropa Point, where a small group of laborers, estimated as high as a hundred, fled when the point was captured. Their intention perhaps was to try to escape through the swamps and jungles, and scatter into the interior. . . .
Americans and Australians however drew a line around them from all sides and made contact along the beach between Buna Mission and Giropa Point, and methodically mopped up the enemy pocket. 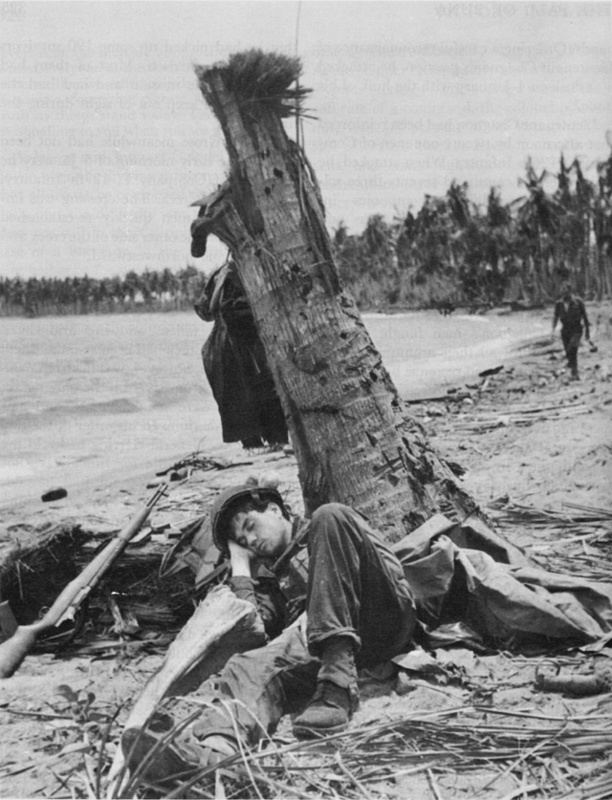 Americans quelled the last resistance to Buna Mission by Sunday noon in a little thicket on the beach where a few Japanese held out in bunkers. Routed from the bunkers, some scurried behind a wrecked barge on the beach and continued to fire. They were finally killed by a high explosive charge that blew the barge and the Japanese to bits. 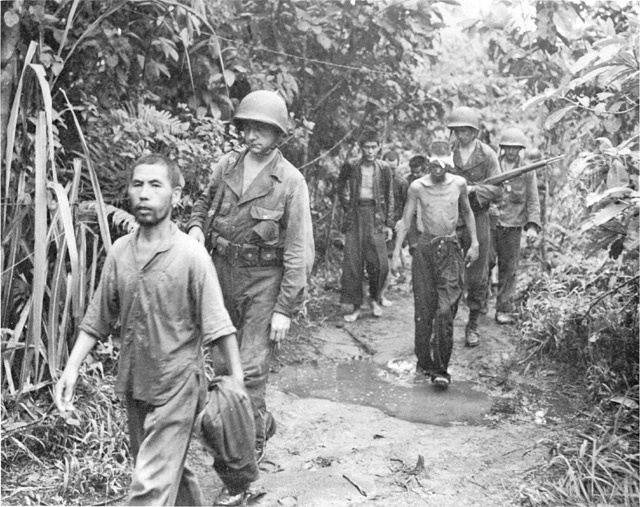 By noon, the Americans had counted roughly 150 Japanese dead in the Buna Mission area. Some 190 Japanese were finally buried at Buna Mission, and 300 at Giropa Point. EMACIATED PRISONERS BEING LED TO THE REAR AREA for questioning.
. . . Be sure to rinse the dyed jungle equipment over and over again in cold water, otherwise it will ruin everything [and] make everything stink. . . . Furthermore, we are not sure [the dye] is not absorbed by the body, and then excreted in the urine, because some of the urine would indicate [that was the case]. . . . Tablets for individual chlorination of water in the canteen would be of the greatest value for all; two pairs of shoes are definitely needed [because] everything dries very slowly. A chigger repellent for each individual is needed for there are millions of the little fellows. WEARY SOLDIER SLEEPS after the battle is over. With the 127th Infantry in position to move on Tarakena, and the 18th Brigade, the tanks, and most of the guns in use at Buna available for use on the other side of the river, the time had come to move on the enemy's Sanananda-Giruwa position in force. 1. Tel Msg, Col Myers to Col Howe, Ser 4540, 29 Dec 42; 3d Bn, 128th Inf, Jnl, 2257, 29 Dec 42; Rpt on Opns 18th Bde Gp at Cape Endaiadere and Giropa Point. The 18th Brigade was replaced on Goodenough Island by the 7th Brigade from Milne Bay--the 2/12 Battalion, for instance, being replaced there by the 25 Battalion. 2. Tel Msg, Lt Winkler to Maj Hawkins, Ser 4541, 29 Dec 42; Buna Force G-3 Sitrep, 29 Dec 42; Overlay, Buna Force Dispositions, 1700, 29 Dec 42; Rpt on Opns 18th Bde Gp at Cape Endaiadere and Giropa Point. 3. Tel Msg, 18th Bde to 32d Div, Ser 4554, 29 Dec 42. 4. Tel Msg, Maj Ziebell to Col Howe, Ser 4565, 29 Dec 42; Tel Msg, Capt Conley to Col Howe, Ser 4577, 29 Dec 42; Tel Msg, 18th Bde to 32d Div, Ser 4579, 29 Dec 42; 128th Inf Jnl, 1715, 1750, 29 Dec 42; Rpt on Opns 18th Bde Gp at Cape Endaiadere and Giropa Point. 5. 1st Bn, 126th Inf, Jnl, Sers 1027, 1034, 30 Dec 42; 3d Bn, 128th Inf, Jnl, 0831, 1033, 1300, 1500, 1730, 30 Dec 42; 32d Div Sitreps No. 134, 30 Dec 42, No. 136, 31 Dec 42; Buna Force G-3 Sitrep, 31 Dec 42; 32d Div Overlays, 31 Dec 42; Rpt on Opns 18th Bde Gp at Cape Endaiadere and Giropa Point. 6. 18th Aust Inf Bde Gp Opns Order No. 2, 31 Dec 42; 1st Bn, 128th Inf, Jnl, Ser 6, 31 Dec 42. 7. Hist Port Det E, COSC, Buna; 32d Div G-4 Sec, Rear Echelon, Record of Air Shipments, 13 Nov 42-23 Jan 43; 32d Div AAR, Papuan Campaign; 32d Div QM Det, Rpt on Activities, Papuan Campaign; Interv with Col Moffatt, 23 Feb 50. The tonnage brought in by the freighters during the twenty-day period in question included 3,100 tons of general cargo and an estimated 900 tons of tanks, vehicles, and road-building equipment for which no precise figures are available. The six freighters were the Karsik, the Japara, the Bantam, the Mulcra, the Bath, and the Comara. The Karsik made three individual trips during this period; the Japara, two; the rest, one each. 8. 1st Bn, 128th Inf, Jnl, Sers 2, 3, 5, 12, 1 Jan 43; 3d Bn, 128th Inf, Jnl, 1445, 1545, 2230, 1 Jan 43; No. 138, 32d Div Sitrep, 1 Jan 43; Rpt on Opns 18th Bde Gp at Cape Endaiadere and Giropa Point. 9. Ltr, Col MacNab to author, 25 Nov 49. The explosive ammonal consists of a mixture of ammonium nitrate, powdered aluminum, and charcoal, and is noted for its powerful blast properties. 10. Tel Msg, Lt Winkler to Col Howe, Ser 4862, 2 Jan 43; Tel Msg, 18th Bde to 32d Div, Ser 4878, 2 Jan 43; Tel Msg, 18th Bde to Adv NGF, Ser 4918, 2 Jan 43; 32d Div Sitrep No. 140, 2 Jan 43; Buna Force G-3 Sitrep, 2 Jan 43; Rpt on Opns 18th Bde Gp at Cape Endaiadere and Giropa Point; Ltr, Col MacNab to Gen Ward, 7 Mar 51. 11. Ltr, Col MacNab to Gen Ward 7 Mar 51. Colonel MacNab recalls the attack in these words: "Arnold and I took our outfits in with a sort of oldtime flourish. . . . Arnold and I had been in view of each other almost continuously during this period each in the front line of his troops. . . . When he had gotten fairly close to the line of bunkers (we were coming in on their rear and flank) he yelled to my troops, 'Where is the American commander?' I replied . . ., 'you know damn well where I am you've been trying to get abreast for an hour.' He yelled 'Let's get the bastards,' and I yelled at my Company L and one platoon of Company K in the front wave, 'Come on you grease balls.' (Never before or since have I ever called a man that.) We all Aussies and Yanks, went in on the run. There were not many Japs left. We killed them in the grass with bayonets, and . . . when we couldn't reach them [with fire]." Ltr, Col MacNab to author, 18 Apr 50. MacNab was later awarded the Distinguished Service Cross. The citation is in Hq USAFFE GO No. 34, 21 Jun 43. 12. 3d Bn, 128th Inf, Jnl, 1930, 2 Jan 43, 0723, 0810, 3 Jan 43; Rpt on Opns 18th Bde Gp at Cape Endaiadere and Giropa Point. 13. Col Grose's Diary, 28 Dec 42; Intervs with Col Grose, 18 Nov 50, 1 Feb 51; Ltr, Col Grose to Gen Ward, 26 Feb 51. 14. Tel Msg, Capt Hewitt, Ser 4474, 28 Dec 42; 127th Inf Jnl, 1428, 28 Dec 42; Col Bowen, Certificate, 3 Jan 43, copy in OCMH files; Rpt, CG Buna Forces, p. 3. 15. Ltr, Col Grose to Gen Ward, 26 Feb 51. This finger was a narrow spit of land projecting from the vicinity of Buna Village to the mouth of Entrance Creek. It will be called hereafter the village finger. The finger on the other side of the mouth of Entrance Creek will be called the mission finger. 16. 127th Inf Jnl, 1428, 1538, 28 Dec 42; 127th Inf Tact Hist, 28 Dec 42. 17. 127th Inf Jnl, 1515, 1538, 1720, 1735, 28 Dec 42; 127th Inf Tact Hist, 28 Dec 42; Col Grose's Diary, 28 Dec 42; Col Bowen, Certificate, 3 Jan 43; Interv with Col Grose, 18 Nov 50; Ltr, Col Rogers to author, 26 Jun 50; Ltr, Maj Philip A. Jenson to author, 24 Jun 51; Ltr, Col Grose to Gen Ward, 26 Feb 51. S. Sgt. Milan J. Miljativich of Company K took command when Lieutenant Riggs' boat sank and tried desperately to redirect the rest of the boats to the mission. He was later awarded the Distinguished Service Cross. The citation is in Hq USAFFE GO No. 34, 21 Jun 43. 18. 127th Inf Jnl, 1735, 28 Dec 42, 2215, 29 Dec 42; 127th Inf Tact Hist, 27 Dec 42, 28 Dec 42; Ltr, Col Rogers to author, 26 Jun 50; Ltr, Col Grose to Gen Ward, 26 Feb 51; Ltr, Col Herbert A. Smith to Gen Ward, 20 Mar 51. The six volunteers were later awarded the Distinguished Service Cross. Their citations are in GHQ SWPA GO No. 11, 22 Jan 43. Colonel Bowen and Colonel Rogers who were both active at the southern end of the bridge trying to get the attack started, were also awarded the Distinguished Service Cross. For Colonel Rogers, who was twice wounded that afternoon, it was the second time in the campaign that he was to be so decorated. Colonel Bowen's citation for the Distinguished Service Cross is in GHQ SWPA GO No. 4, 10 Jan 43; Colonel Roger's citation for the Oak Leaf Cluster to the Distinguished Service Cross is in GHQ SWPA GO No. 7, 15 Jan 43. 19. 127th Inf Jnl, 1850, 27 Dec 42; Col Grose's Diary, 27 Dec 42; Interv with Col Grose, 18 Nov 50; Ltr, Lt Col W. A. Larson to author, 23 Jan 51. 20. Tel Msg, Col Bowen to Col Howe, Ser 4539, 29 Dec 42; 2d Bn, 126th Inf, Jnl, 0935, 1200, 1220, 29 Dec 42; 127th Inf Jnl, 0750, 1320, 29 Dec 42; 32d Div G-3 Daily Periodic Rpt, 29 Dec 42. 21. Urbana Force FO No. 1, 30 Dec 42, FO No. 2, 30 Dec 42; 127th Inf Jnl, 1700, 30 Dec 42; 127th Inf Tact Hist, 30 Dec 42; Ltr, Col Herbert A. Smith to Gen Ward, 20 Mar 51. 22. 127th Inf Jnl, 0625, 30 Dec 42; 127th Inf Tact Hist, 30 Dec 42. 23. 127th Inf Jnl, 0710, 1320, 29 Dec 42, 0815, 1035, 1050, 1120, 1220, 1330, 1630, 30 Dec 42; 32d Div G-3 Daily Periodic Rpt, 29 Dec 42; 127th Inf Tact Hist, 29 Dec 42, 30 Dec 42; 32d Div Overlays Papuan Campaign, 30 Dec 42. 24. 127th Inf Jnl, 0430, 0505, 31 Dec 42; 2d Bn, 128th Inf, Jnl, 0700, 31 Dec 42; 127th Inf Tact Hist, 31 Dec 42; Col Grose, Affidavit, 7 Apr 44, in 450.4, I Corps File, in AGO RAC Files; Memo, Col Grose, Comments on the Buna-Sanananda Operation, 20 Feb 46, copy in OCMH files; Ltr, Col Grose to Gen Ward, 26 Feb 51. 25. Col Grose's Diary, 31 Dec 42; Ltr, Gen Eichelberger to Gen Sutherland, 31 Dec 42, copy in OCMH files; Ltr, Col Grose to Gen Ward, 26 Feb 51. 26. Ltr, Col Grose to Gen Ward, 26 Feb 51. 27. 127th Inf Jnl, 0505, 0610, 0635, 31 Dec 42; 127th Inf Tact Hist, 21 Dec 42; Ltr, Gen Eichelberger to Gen Sutherland, 31 Dec 42; 32d Div G-3 Daily Periodic Rpt, 31 Dec 42; Col Grose, Affidavit, 7 Apr 44; Col Grose, Comments on the Buna-Sanananda Operation, 20 Feb 46. 28. Statement of unnamed POW, in 1st Bn, 128th Inf, Jnl, 1232, 1 Jan 43. The submarine, which had surfaced and shelled the shore the same night got away safely. 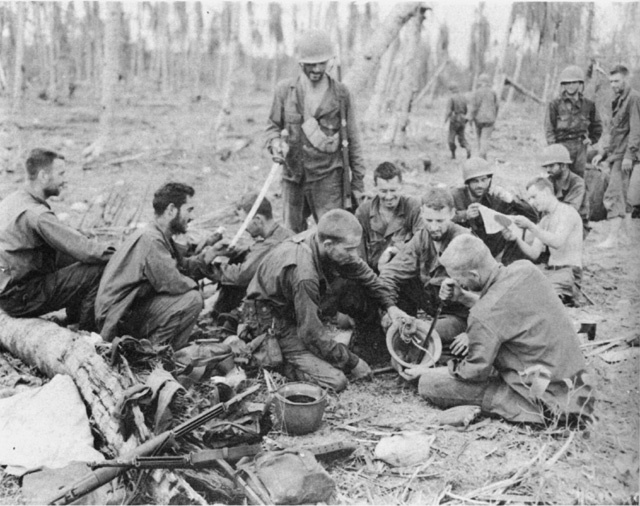 127th Inf Tact Hist, 25 Dec 42; 32d Div Hist of Arty, Papuan Campaign. 29. 2d Bn, 126th Inf, Jnl, 31 Dec 42; 127th Inf Jnl, 0818, 31 Dec 42; 32d Div G-3 Daily Periodic Rpt, 31 Dec 42; 127th Inf Tact Hist, 31 Dec 42; Ltr, Gen Eichelberger to Gen Sutherland, 31 Dec 42; Rpt, CG Buna Forces, p. 36. Pvt. Earl Johnson and Pfc. Elerman Bender of Company M, 127th Infantry--both killed that day--greatly distinguished themselves in the fighting along the coast. Johnson was killed while covering the withdrawal of his squad from a dangerously advanced position where it had been pinned down by enemy fire; Bender met his death as the result of a bold dash through an open field swept by enemy fire to find the flank of a neighboring unit with which all contact had been lost. Both men were posthumously awarded the Distinguished Service Cross. The citations are in Hq USAFFE GO No. 32, 15 Jun 43. 30. Tel Msg, Brig Wootten to Col Howe, Ser 4486, 28 Dec 42; Tel Msg, Maj Henry G. Nuiton to Col Bowen, Ser 4680, 31 Dec 42; 32d Div G-3 Daily Periodic Rpt, 31 Dec 42. 31. Ltr, Gen Eichelberger to Gen Sutherland, 31 Dec 42. 32. Ltr, Gen Eichelberger to Col Rex Chandler, DCofS, I Corps, Rockhampton, 31 Dec 42, in 312, I Corps File, in ORB RAC, AGO. 33. Buna Shitai Opns Orders No. 44, North Giruwa, 31 Dec 42, in ATIS CT 29, No. 350; 18th Army Opns I, pp. 27, 28. 34. 18th Army Opns I, pp. 27, 28; Buna Shitai Opns Orders No. A-39, 27 Dec 42, in ATIS CT 29, No. 350. 35. 127th Inf Jnl, 1600, 1850, 1900, 1 Jan 43; G-3 Daily Periodic Rpt, Buna Force, 1 Jan 43; Ltr, Gen Eichelberger to Gen Sutherland, 1 Jan 43, copy in OCMH files. During this day's action Pvt. Robert H. Campbell of Company M, 127th Infantry, crawled to the rescue of a wounded member of the company, who was lying in the open in the direct line of fire of an enemy machine gun. Campbell was later awarded the Distinguished Service Cross. The citation is in Hq USAFFE GO No. 34, 21 Jun 43. 36. 127th Inf Jnl, 1300, 1 Jan 43; Ltr, Gen Eichelberger to Gen Sutherland, 1 Jan 43. 37. 127th Inf Jnl, 0545, 0600, 0706, 0745, 0800, 0815, 0905, 0930, 1010, 1040, 2 Jan 43; 127th Inf Tact Hist, 2 Jan 43; G-3 Daily Periodic Rpt, Buna Force, 2 Jan 43; Ltr, Gen Eichelberger to Gen Sutherland, 2 Jan 43, copy in OCMH files. 38. 18th Army Opns I, p. 29. 39. Ltr, Gen Eichelberger to Gen Sutherland, 2 Jan 43. 40. 127th Inf Tact Hist, 2 Jan 43; Ltr, Gen Eichelberger to Gen Sutherland, 3 Jan 43, copy in OCMH. 41. 127th Inf Jnl, 1315, 1523, 1627, 2 Jan 43; 127th Inf Tact Hist, 2 Jan 43; Ltr, Gen Eichelberger to Gen Sutherland, 2 Jan 43; F. Tillman Durdin, The New York Times, 8 Jan 43; Rpt, CG Buna Forces, p. 36; Col Grose, Comments on the Buna-Sanananda Opn, 2 Feb 46. For their performance in the day's fighting, Colonel Grose and Captain Runnoe were later awarded the Distinguished Service Cross. Grose's citation is in GHQ SWPA GO No. 4, 10 Jan 43; Runnoe's, in Hq USAFFE GO No. 34, 21 Jun 43. 42. Tel Msg, Capt Hewitt to Col Howe, Ser 4892, 2 Jan 43; Msg, Gen Eichelberger to Adv NGF, Ser 4897, 2 Jan 43, in 32d Div G-3 Jnl; 127th Inf Jnl, 1550, 1554, 1600, 1627, 1712, 2 Jan 43; 127th Inf Tact Hist, 2 Jan 43; Durdin, The New York Times, 8 Jan 43; Col Grose, Comments on the Buna-Sanananda Operation, 20 Feb 46. 43. 127th Inf Jnl, 1930, 2 Jan 43; Buna Force G-3 Sitrep, 2 Jan 43; Ltr, Gen Eichelberger to Gen Sutherland, 2 Jan 43; Rpt, CG Buna Forces, p. 37. 44. Durdin, The New York Times, 8 Jan 43. 45. Tel Msg, 18th Bde to 32d Div, Ser 4869, 2 Jan 43; Tel Msg, Capt George E. Aurell to G-2, 32d Div, Ser 4889, 2 Jan 43; Tel Msg, 18th Bde to Adv NGF, Ser 4918, 2 Jan 43; Ltr, Gen Eichelberger to Gen Sutherland, 7 Dec 42, copy in OCMH files. 46. Rpt on Opns 18th Bde Gp at Cape Endaiadere and Giropa Point; 127th Inf Tact Hist, 2 Jan 43; Ltr, Gen Eichelberger to Gen Sutherland, 7 Jan 43; Rpt, CG Buna Forces, p. 42. 47. Memo, Gen Eichelberger for American troops in the Buna Area, 3 Jan 43, Ser 4649, in 32d Div G-3 Jnl. 48. Msg, Gen Blamey to Brig Wootten, Ser 4988, 3 Jan 43, in 32d Div G-3 Jnl. 49. Lt Gen Edmund F. Herring, GOC New Guinea Force, Order of the Day, 3 Jan 43, copy in OCMH files. 50. Msg, Gen MacArthur to Gen Marshall, No. C-43, CM-IN 2047, 5 Jan 43. Marshall's message is No. 91, CM-OUT 1193, 4 Jan 43. 51. Ltr, Gen Eichelberger to Gen Sutherland, 7 Jan 43; Rpt, CG Buna Forces, p. 42. The above figure includes only the counted dead. It does not include Japanese dead who could not be counted because their bunkers had caved in or had been sealed up during the fighting. 52. Rad, Gen Eichelberger to Lt Col G. C. Sherman, G-1 Rear Echelon, 32d Div, Ser 5298, 9 Jan 43, in 32d Div G-3 Jnl; Rad, Col Sherman to CG Buna Forces, 1455, 10 Jan 43, in 32d Div G-1 Jnl. These figures are of 6 January, and thus include casualties sustained in the mop-up. They do not include a figure for those who were wounded before 6 January and died of their wounds after that date. It should be noted that the figures are for Buna only. They do not include the casualties sustained by the 1st and 3d Battalions, and attached troops, of the 126th Infantry on the Sanananda front, who as of 6 January had suffered 394 casualties--76 killed 235 wounded, and 83 missing. Jnl, Maj Boerem's Det, 6 Jan 43. 53. Rpt on Opns 18th Bde Gp at Cape Endaiadere and Giropa Point. Of the 267 Australians killed, 230 were killed in action, and 37 died of wounds. 54. Rpt, CG Buna Forces, p. 42. 55. Durdin, The New York Times, 8 Jan 43; Interv with Col Moffatt, 24 Feb 50; Interv with Col Teesdale-Smith, 10 Mar 50; Interv with Col Grose, 18 Nov 50; Interv with Maj Odell, 14 Dec 50. 56. Ltr, Maj E. Mansfield Gunn, MC, I Corps, to 1st Lt. C. A. Farish, I Corps Rear Echelon, Rockhampton, 10 Jan 43, in I Corps Corr File. 57. Memo, Col Warmenhoven for CG 32d Div, 16 Jan 43, incl to 1st Ind, 32d Div Hq to Regimental Combat Teams of 32d Div, 114th Engr Bn, and Hq Co, 32d Div, 16 Jan 43, copy in OCMH files; 32d Div Hist of Medical Activities, Papuan Campaign, in Surgeon General's Hist File. 58. 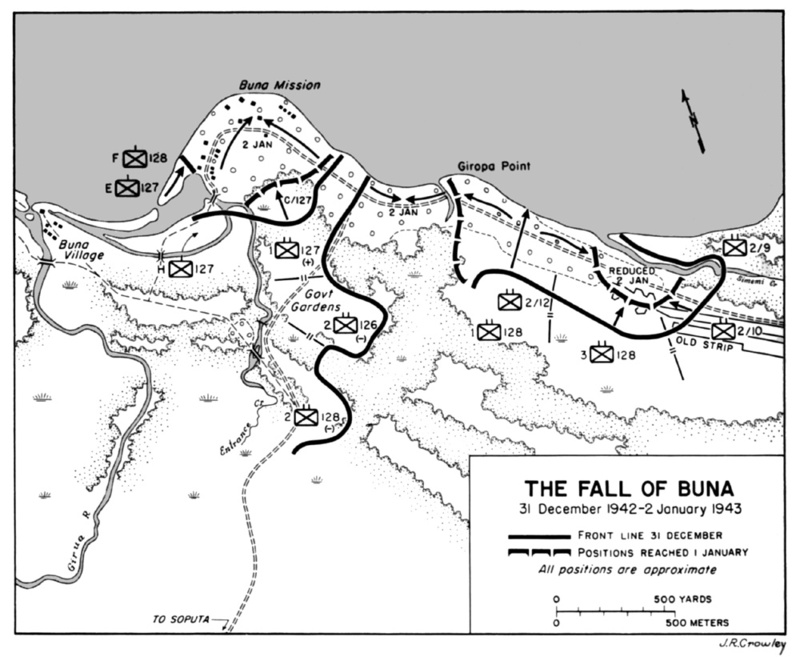 Ltr, Col Warmenhoven to CG Buna Forces, 15 Jan 43, sub: Health of the Command: Final Report, copy in OCMH files. 59. Diary, Maj Nojiri, CO 1st Bn, 170th Inf, in ATIS CT 29, No. 350; 18th Army Opns I, p. 27. The reason for the delay was a shortage of gasoline for the motor launches which were to bring the men in from the Amboga River area. Yazawa waited as long as he dared for the troops to arrive. Unable to wait any longer, he left for Buna Mission the evening it fell with the men already at hand. 60. 127th Inf Jnl, 1830, 1910, 4 Jan 42; 127th Inf Tact Hist, 4 Jan 12; 18th Army Opns I, pp. 28, 29. 61. Tel Msgs, Capt Hewitt to Buna Force, Ser 5047, 4 Jan 43, Ser 5051, 4 Jan 43, Ser 5106, 5 Jan 43, Ser 5108, 5 Jan 43; 127th Inf Jnl, 1100, 1900, 4 Jan 43, 1430, 5 Jan 43; 127th Inf Tact Hist, 4 Jan 43. Capt Louis A. Chagnon, The Actions of a Left Flank Security Patrol During the Operations of the 32d Division at Buna, 16 December 1942-4 January 1943, Infantry School Monograph, in TIS Files. As a result of his reconnaissance, Yazawa set the strength of Chagnon's force when he scattered it on the 4th as about 100 men--a remarkably close estimate. 62. Maj Nojiri's Diary, in ATIS CT 29, No. 350; 18th Army Opns I, pp. 28, 29. 63. 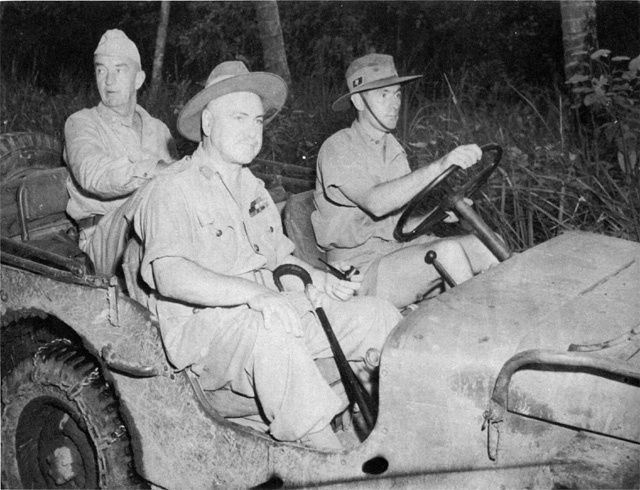 Col Grose's Diary, 4 Dec 42; Col Grose, Comments on the Buna-Sanananda Operation, 20 Feb 46. 64. Gen Herring, Order of the Day, 3 Jan 43. 65. Ltr, Col Leslie M. Skerry, I Corps Adv Echelon, to Col M. J. Conway, Adj Gen, I Corps Rear Echelon, Rockhampton, 15 Jan 43, in I Corps Corr File.